Having some friends over for the big game, but limited on seating? Looking for an inexpensive way to add seats without taking up a lot of room or wasting money on renting? Well this Anheuser Busch A & Eagle 24 inch cushioned stool is the way to go! 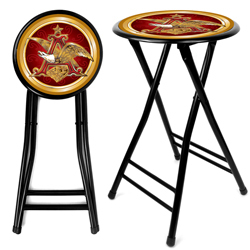 Impress your friends with your comfortable Anheuser Busch A Eagle branded stool. Measures 14 x 15 x 24 inches opened and folds down to 2.5 x 13.5 x 35.5 inches (length x width x height).